For those who may not have already been informed, earlier today we have been given the very sad news that Whickham and District Motor Club President Mike Rowe sadly passed away this morning, Tuesday the 12 March 2019. Mike Rowe was one of the founder members of Whickham and District Motor Club Limited, and has over the years been a stalwart of the club, from his early days when the Club had just been formed to recent years when he has been in attendance at our prominent Club events such as our Annual General Meeting&nbsp;and Awards Ceremonies. Mike could often be quite a forceful character, and was certainly known as a man that would speak his mind. He leaves a considerable amount of good friends who have known him for a number of years, together with many memories that will bring either a smile or tear to the eye upon recollection. I have great memories of working with Mike on the 488 Rally a number of years ago. Many people will have memories of Mike both as a competitor with the likes of Mac Bater, John Saint and Ken Ridley at all levels of Rallying and also as an organizer. Mike was the one who instigated the Cheviot Stages Rally and was the mainstay of the event for many years, as well as the Shaw Trophy Rally when it was one of the premier Road Rallies in the North East. We must not forget the Lambton Rally Sprint or the Easter Stages that he also organised. If there was an event being run by Whickham Mike was alway there. I am sure that you will all join me in wishing his wife Joan our sincere condolences at this difficult time, and am sure we will be informed of further details in the fullness of time. Interested in Cars? Motorsport? Rallying? Nothing to do on a Wednesday night? Why not come along to one of our Motor Club nights and brighten up the middle of your week? 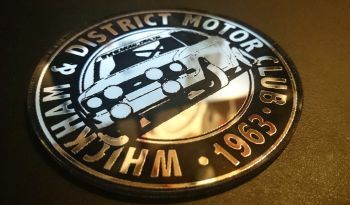 Whickham and District Motor Club meet every Wednesday evening from around 8:30pm at the Kibblesworth Workmens Club, a local village venue offering a friendly welcome and extremely reasonable prices to all our members. A Wednesday evening at WDMC is not just about meeting up for a drink and a chat - or a "Noggin and Natter", we try to have something happening at the Club each time we meet. Would you like to start in Motorsport? If you would like to get started in Motorsport, then you are quite lucky as the RACMSA has a specific website just for you. Full of helpful hints and tips and advice to help get you started, its a valuable resource and learning tool to help anyone who fancies getting a bit more involved. Who knows - you just might be the next Motorsport Superstar! Events Whickham & District Motor Club are involved in organising. A production car auto test run at the old Whittle Colliery, near Morpeth. Classic and Targa rally held around the beautiful Northumberland countryside. Tarmac event run over the Otterburn ranges, in co-promotion with Hadrian Motor Club. Co-promotion between Whickham & District Motor Club and Hawick and Borders Car Club. WDMC will support the clubs junior stage rally competitors with a £100 bonus being paid to the highest placed junior driver and co-driver in the overall classification of the Stage Rally Championship at the end of 2018. The winners will then be able to use the bonus to offset entry fees on WDMC organised or co-promoted events in 2019. For example the bonus could be put towards the cost of an entry on the Cheviot or Border Counties Rallies or used to enter a number of 12 Car Rallies. Full details of the scheme are contained within the regulations for the 2018 Club Stage Rally Championship. A Junior is defined as a club member aged 29 or younger on the 1st January 2018 and regulations require an eligible member to notify the championship co-ordinator they are taking part in a championship. The Club meets every Wednesday night at Kibblesworth Workmen's Club - new members are always welcome.